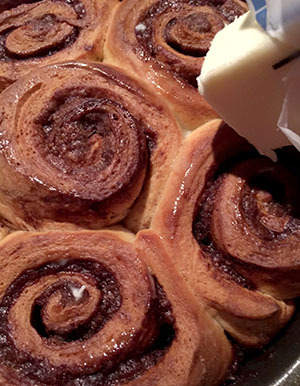 My mom got up in the wee hours of the morning to do this, because the rolls were made in small batches — many, many small batches of her favorite simple bread dough recipe she let rise once , then shaped into the long rolls of dough filled with butter, white sugar and cinnamon and sliced into enticing swirls. She baked them in every pan in every size she had. There were clusters of these sweet buns in round cake tins, 13-by-9 glass dishes, square and loaf pans. She’d pull them out of the oven and gingerly tip them out to see if their bottoms were browned adequately, and if so, take a stick of butter or margarine and rub the top of each panful, letting the bread’s heat soak up an extra buttery sheen. She then glazed them simply, while still warm. Then after some cooling, wrapped them up and distributed them over the course of a day or two. And everyone LOVED them. She claims now that she doesn’t know where she got her pep. Knowing more about bread-making now than I did then, I don’t know, either. At the time, it all seemed so simple and easy, dozens of cinnamon rolls. But I know better. 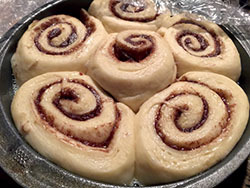 I’ve been wanting to make cinnamon rolls all year, and even years before, for a Christmastime bread for “A Woman Sconed.” I do actually do some planning with this blog, and my “list” of forecasted breads for the last seven years has always included cinnamon rolls in honor of the woman who taught me to bake and taught me to give baking. Why I’ve only gotten to it now I’m not sure. I’ve been distracted away by other prospects maybe. Or I’ve been saving this one ’til now…for some reason. 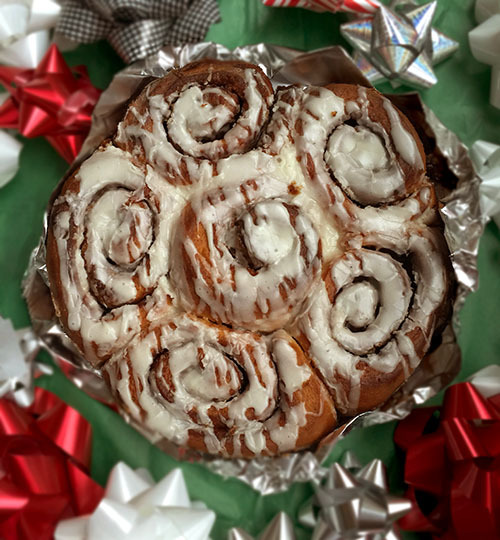 My cinnamon roll-baking came after about a month or more of nonstop baking/cooking projects, deadlines, endless exhaustion at my job, and cobbled together Christmas stuff — presents, decorating, etc. It wasn’t in me to make another thing, I’m sad to say. I’ve been feeling this lately, and it worries me. That perhaps AWS is burned out on the making, or she’s just burned out. She’s getting old, too, she tells herself, and perhaps she is dwindling in the drive — both physically and mentally — to keep doing this. 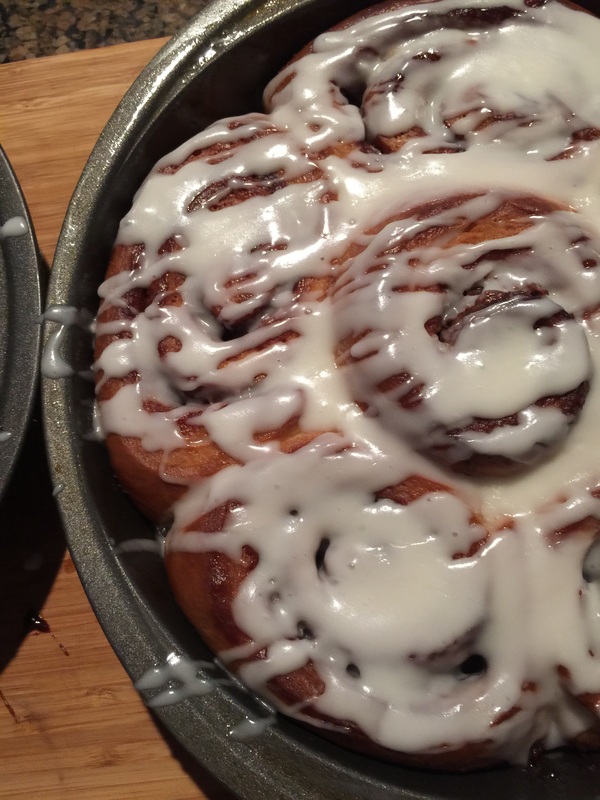 I gathered more than ingredients to make a batch of holiday cinnamon rolls. I gathered who my mother was, and who I was as the young girl, watching. I gathered what was left of me and the year I’d been through and the one bread I’d wanted to make as a gift. To myself. Yes, Sometimes we must do THAT. I don’t know where my mom got her pep to make dozens of cinnamon rolls, but as I let my single batch of dough come together and rise, I knew making bread really made me happy, or, at least, soothed my troubles. Like nothing else. 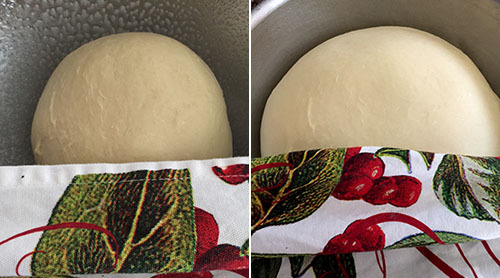 When your dough rises like it should, you start to believe in everything else than can be. I blended my mother’s recipe with a new one I discovered, and mixed her filling of straight granulated sugar (with LOTS of cinnamon) with one that was all brown sugar (I ended up with mostly white and a little brown). 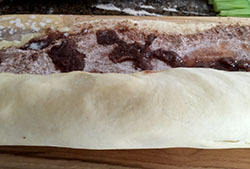 I rolled the dough round its filling, tightly as I could, the smooth, fleshy dough cooperating (and there is gratitude in that, as well as all the steps leading to THAT, like active yeast, proper kneading, proper rising, proper attitude). 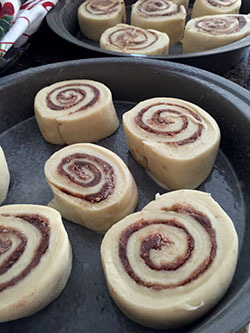 I took a moment to christen a new chef’s knife and cut the long roll into segments for the individual rolls, then laid out the firm spirals in two round cake pans. They looked even and concise, these swirls, and I knew they had all they needed to become what they would be. Here, I took a chance, another faith of sorts, and put the un-raised rolls in the fridge overnight to bake in the morning, which my “recipe” assured would work. If my mother had been so advised or she had so trusted, I wonder if it would have helped, to not herself rise in the wee hours to begin the whole process from scratch. Still, she had to do it her way, finding comfort in her own process. And she did have the pep (and she still does). I raised my own rolls early the next morning, and their time in the fridge did not dissuade them from lift-off. Once I felt sure baking was complete (yes, I tipped the pan to make sure their bottoms were browned), I took a stick of butter — and my mother’s hand — to the rolls, hot and golden brown from their baking, and gave them an initial shiny veneer. I followed with a second coat of a simple confectioner’s sugar glaze (melted butter, powdered sugar, milk, vanilla, a pinch of salt). I kept a light hand with the glaze…my belief is that frostings and glazes are an accent, not to be overloaded, particularly for a bread. Meanwhile, combine flour, the remaining 2 tablespoons sugar, the baking powder and the salt in a large bowl or in the bowl of a stand mixer fitted with the paddle attachment. Mix briefly to combine. Lightly grease a large bowl with nonstick spray or vegetable oil and place dough in the bowl. Cover tightly with plastic wrap and place in a warm, draft-free area. (If it’s cold outside, on top of the stove is generally a good bet, as long as the burners and oven aren’t on.) Let sit until the dough has about doubled in size, 1 1/2 to 2 hours. Combine brown sugar, cinnamon and salt in a small bowl. Brush surface of the dough with half of the melted butter and sprinkle brown sugar mixture in an even layer, patting to make sure it’s sticking. Drizzle with remaining butter. teaspoonful to get desired consistency.) Keep in mind the glaze is to be applied while buns are warm, and it will thin out upon contact, so it’s best to err on the thicker side.